Did you know that Samoa has had 7 flags since the history of its nation. The current Samoan flag (red field, blue rectangle top left with 5 white stars: the Southern Cross constellation), was introduced in 1949 while under New Zealand rule? The world’s largest salt water lagoon – Marovo Lagoon, is situated in New Georgia, Solomon Islands. 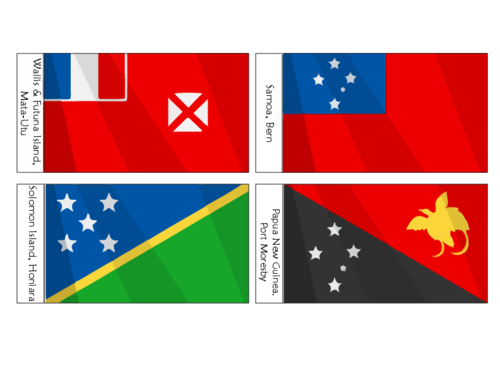 Get your copy of Papua and Futuna Island printable flags, also!